NerdWallet has named New American Funding a two-time winner in its annual Best-Of Awards Program, which highlights the top financial companies and products nationwide for 2018. The consumer finance website selected New American Funding as a Best Mortgage Lender for First-Time Home Buyers with Low Credit Scores and a Best FHA Lender for Borrowers with Nontraditional Credit Histories. To see if you qualify for a loan, please visit this page. "It's an honor to receive this outstanding recognition," said COO Christy Bunce. 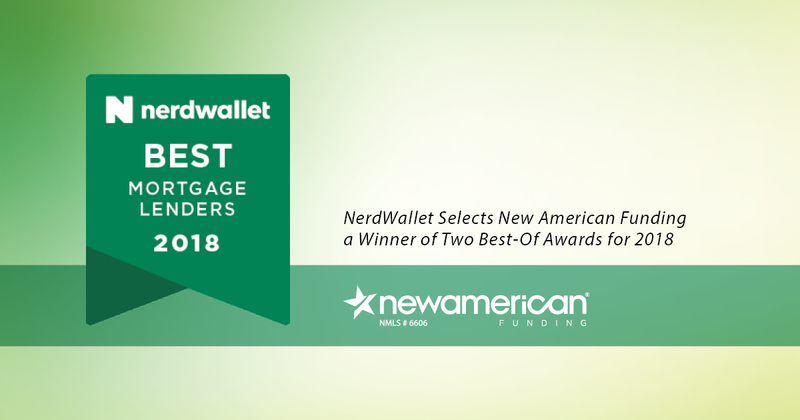 "There's an array of mortgage options on the market and we're proud that NerdWallet has named New American Funding among the best. We work hard to provide our consumers with industry-leading service and to close our loans on time." This is the third year NerdWallet has researched dozens of financial products across multiple verticals in order to help consumers make confident financial decisions. "Consumers have more choice than ever when it comes to personal finance products, and our Best-of Awards highlight those that truly rise to the top," said Tim Chen, NerdWallet Co-founder and CEO. NerdWallet teamed up with New American Funding to help consumers find the right home loan. Due to its excellent customer service, New American Funding has received more than 26,000 positive reviews through Social Survey, more than 5,000 5-star Zillow reviews, and it has an A+ rating with the Better Business Bureau. To visit NerdWallet's Best-Of winners list, click here.